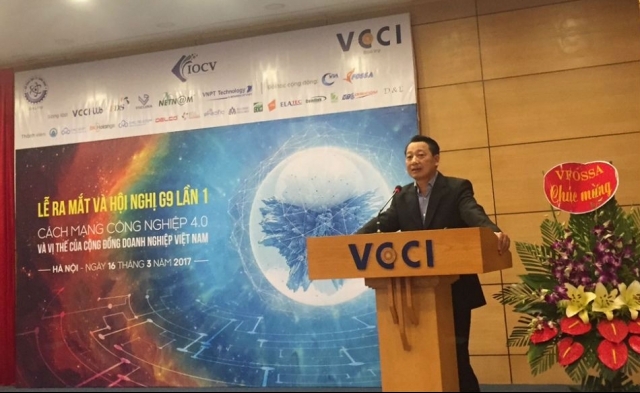 The Vietnam Chamber of Commerce and Industry (VCCI) held the IoT Open Community for Vietnam (IOCV) conference on March 16, discussing the 4th Industrial Revolution and the status of Vietnam’s business community. Attendees heard that the 4th Industrial Revolution is taking place more quickly and more broadly than the first, second and third revolutions, due to the accumulation of practical solutions integrated into fields such as physics, chemistry, and information technology, among others. Opportunities will present themselves regarding costs, improving production efficiency, promoting the creation of new products and services, maximizing the use of data to serve the community, changing the mode of consumption, and reducing the time needed to access information on products and services. The benefits will also be substantial, from the development of modern industrial production, streamlined and efficient management systems, and improvements to quality of life and social welfare, opening up more opportunities for people to promote creativity and startups. Addressing the conference, Mr. Nguyen Quang Vinh, Deputy Secretary General of VCCI, said that businesses need to raise their awareness to take advantage of the 4th Industrial Revolution and enhance their competitiveness during integration. He stressed that to raise awareness among enterprises, training courses and consultancy programs for small and medium-sized enterprises are needed. This will help businesses take advantage of technological advances to increase their competitiveness and productivity. Mr. Le Van Loi, Director of Information Technology for Business (ITB) at VCCI, told VET that the Internet of Things (IoT) will support a range of sectors, including high-tech agriculture and human resources management, etc. This will provide innovation to Vietnam’s economy in the time to come. This is the first time the IOCV has been held in Vietnam.